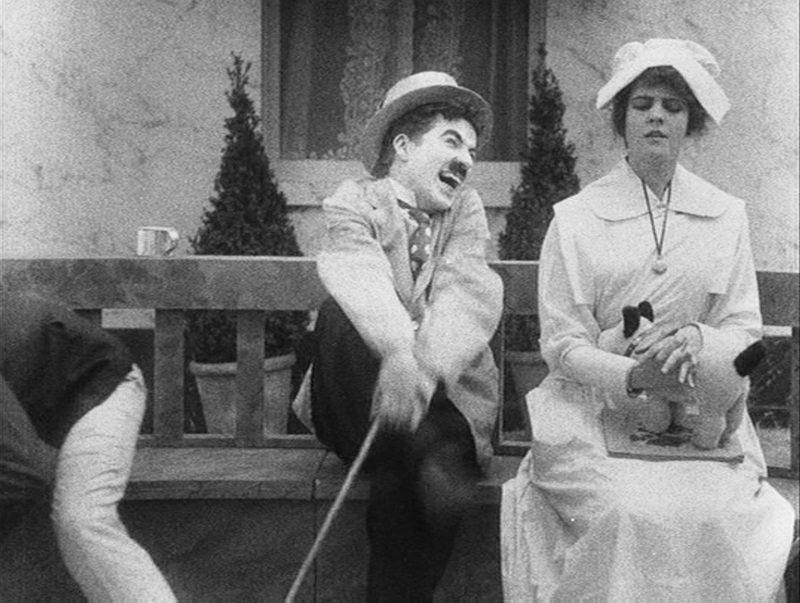 This slapstick short continues Charlie Chaplin’s series with Mutual, following the release of “Easy Street” in January. Chaplin was taking longer to work on his films than he ever had before – this wasn’t released until mid-April – but the result was still very profitable for his studio. This movie takes place in a spa with “healing waters.” We get an insert-shot of the “discoverer” of the healing waters, a sick old man in lying in bed. Then we see a group of seemingly uptight rich people sitting around the well and drinking of the waters. Charlie arrives, apparently drunk, to be cured of his drinking. He steps in the well (but doesn’t quite fall in) on his way to the clinic. He’s having a hard enough time, but then the attendant tries to get him to walk through the revolving doors, which results in the first physical comedy routine of the movie. Charlie skillfully resists entering the building, forcing the attendant to pursue him repeatedly. Eventually, Eric Campbell, in a foot cast, wanders over as well, with predictable results. Charlie eventually gets into the building and Eric limps away in defeat. Finally arriving in his room, we see that Charlie’s chest is full of liquor bottles. He refuses to give the porter a tip, steals his cigarette, then locks his chest while the porter’s beard is caught in it. Albert Austin is an attendant at the spa, and he takes Charlie down to the well. Charlie is more interested in the nurses. He refuses to drink healing water, pouring it into his hat, repeatedly. When he finally takes a sip, he needs to chase with alcohol immediately. Eric is pursuing Edna Purviance and as usual, she is not interested. Charlie thinks he’s coming on to him. While they flirt and fight, various spa employees have discovered Charlie’s stash and are nipping from it. Edna stands up for him when manager-type (Frank J. Coleman) threatens to throw him out as a result. Instead, the manager orders Albert to throw out the remaining alcohol, which he does – throwing the bottles out the window and into the well! Charlie is taken to the massage room, where he sees the masseur (Henry Bergman) abuse a fellow-client. He goes behind a curtain to change, throwing out his shoes when he takes them off. The first one hits Eric Campbell, the second another spa client. They are ready to fight, each accusing the other of throwing a shoe at him, when Charlie throws out his jacket. They pull back the curtain, to find Charlie posing in a swimsuit. He pulls the curtains closed again. Each time they open them, Charlie is in another pose. Eventually, he takes a “swim” in the pool without getting in, while everyone looks on amazed. He is taken to a table by the masseur, and again watches him mangle another client. When it’s Charlie’s turn, he tries a variety of stunts to avoid being massaged, then wrestles the masseuse, throwing him in the pool. Soon, the whole spa is drunk on the liquor in the well. 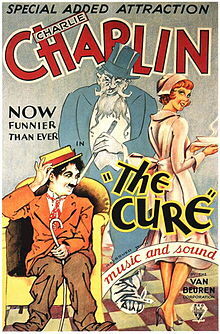 Edna is pursued by drunks, Charlie saves her, and she convinces him to take “the cure” which is laced with liquor. Charlie begins behaving badly, knocks Eric into the well. After Charlie loses control, he fall into the pool himself. The next morning there are plenty of hangovers, but Chaplin turns sober, walks out and finds Edna. Realizing what had happened, she forgives him. They walk ahead, just then he accidentally steps into the liquor-laden well. Charlie Chaplin had been doing rich drunks since his early days on dance-hall stages, and this movie incorporates ideas from his old act with Fred Karno’s comedy company. 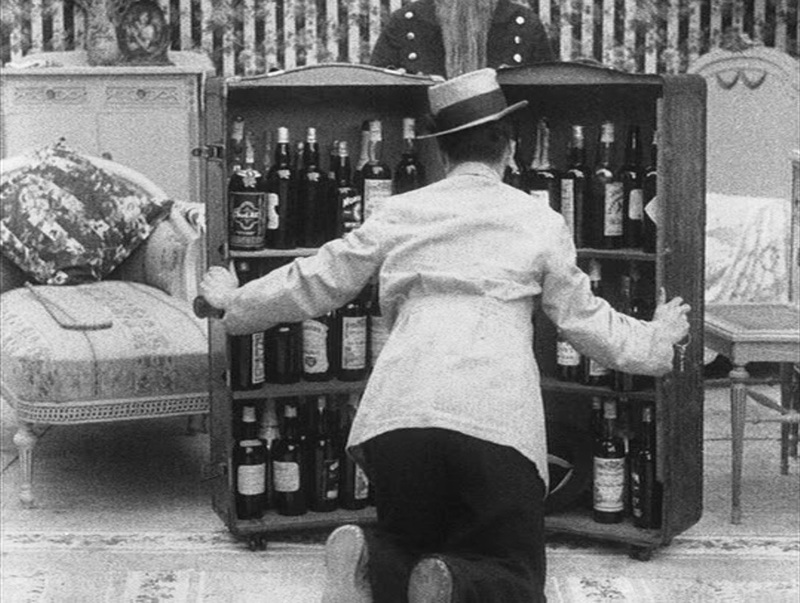 He had already made an entire movie, “One A.M.,” simply around his “drunken” pratfalls and encounters with inanimate objects. 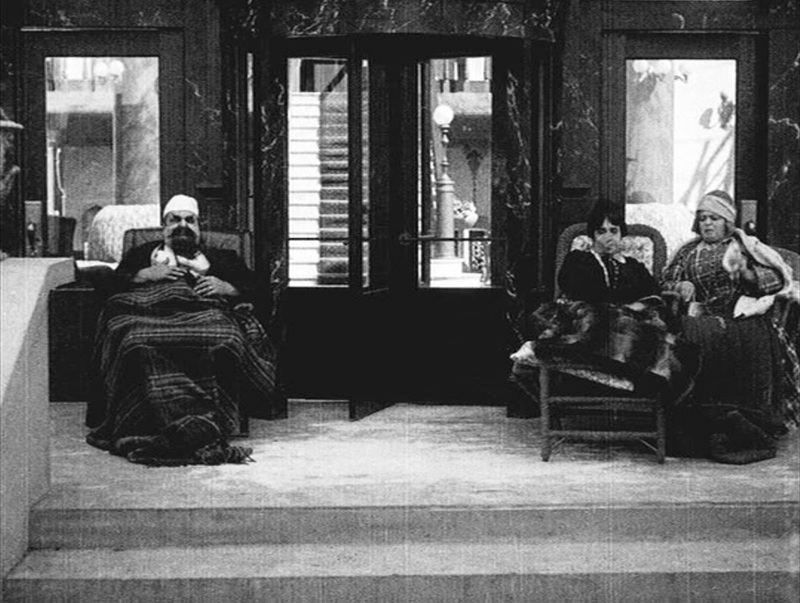 If this movie had simply tried to ride that same theme, it would have been somewhat disappointing, but Charlie added the whole concept of the health spa, which gave him the chance to mock the rich on several levels, and to interact with a whole host of other characters, instead of just doing his drunk bit. Even the sequence with the revolving door, which is basically just a variation on themes from “One A.M.,” exceeds that and goes in unexpected directions, ending before he runs out of new ideas. 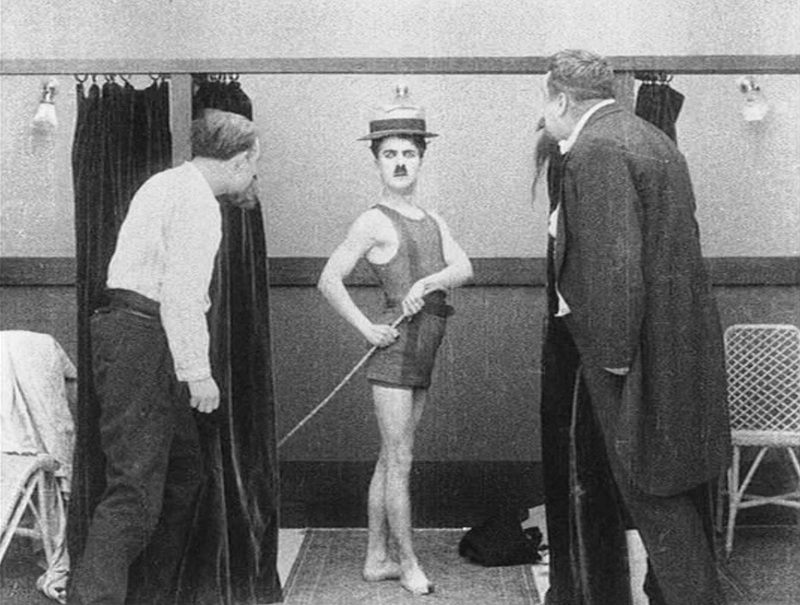 The various “tableaux” of Charlie in his bathing suit are also a parody of a style of performance that was common in music halls. It’s funny when rich people are hungover. 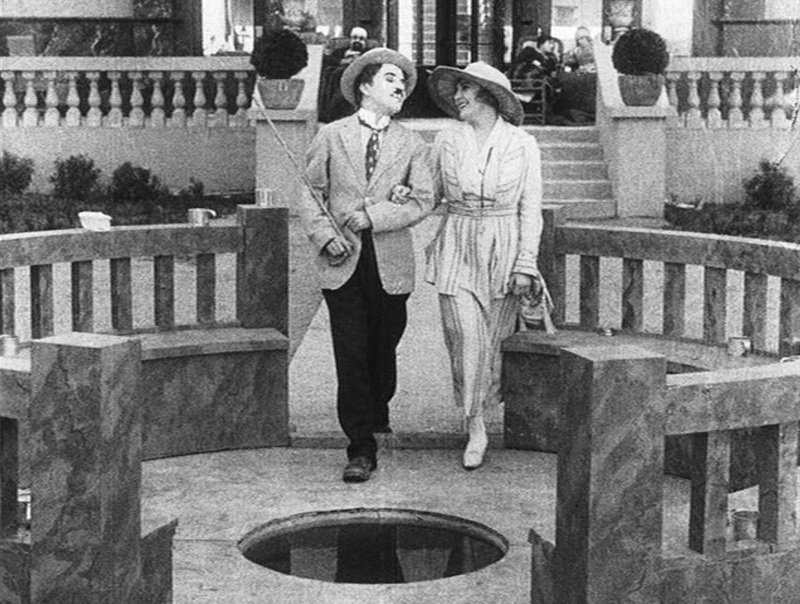 Chaplin claimed that he realized that most people like to laugh at the rich, which is why he often set slapstick movies in high society. Apparently, he gave that a lot of thought in this movie, since early drafts of it had Charlie as a bellboy or other employee of the spa, not the rich drunk that he eventually became. Those who claim that Chaplin’s style relies on his ability as a dancer find a lot of evidence in this movie, which includes those tableaux, his various evasions of harm from the masseur, and a curious little “thank you very much, I told you so” step he gives when Edna defends him from the manager. His body language does add a great deal to his ability to communicate in a silent medium, and he seems to have intuited this to a degree that few other performers had at this time (Douglas Fairbanks might be one exception). 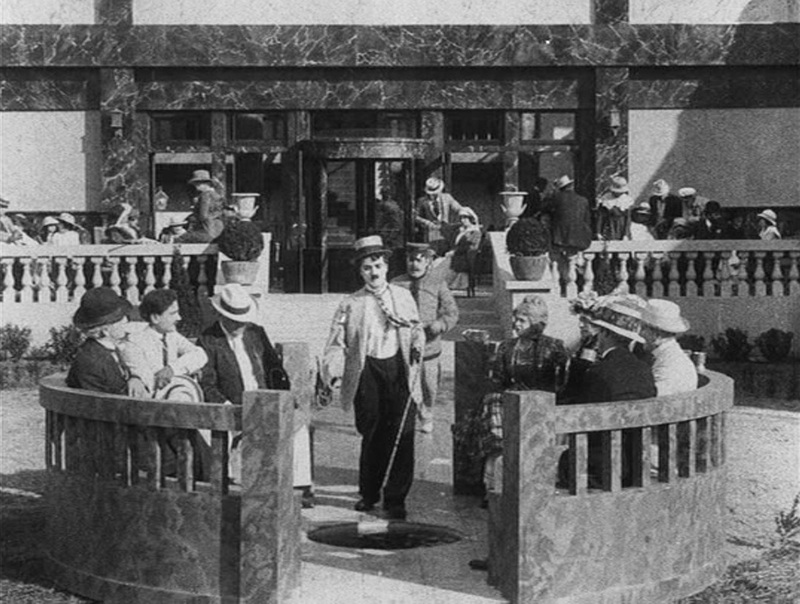 Other comedians often relied on exaggerated actions to get laughs, and some (like Ford Sterling) were very good at this, but I think part of Chaplin’s lasting accessibility is the understatement of his movements, as well as the timing. This one is SO much fun! Loved the costumes and the sets…and I have to say that everything that happened to the creepy bully with the broken leg was completely satisfying. I bet the audience cheered in places. It’s a charmer for sure. Glad you enjoyed!